A scan of the Bishops 336 year-old mummified body has revealed the remains of a five-month-old foetus. The body of the tiny baby was concealed under the feet of Swedish Bishop Peder Winstrup in Lund cathedral. The premature baby was found after scientists conducted a CT scan on the coffin of the Swedish Bishop. His coffin had been laying quietly in the crypt of the Lund cathedral, the Lutheran cathedral in Lund, Scania, Sweden. For nearly 350 years it had concealed the secret of a foetus deliberately buried at the bottom of the coffin. The little corpse, believed to be of a baby born several months prematurely, was revealed for the first time when scientists scanned the coffin and the mummified body of Peder Winstrup, believed to be one of the best preserved 17th-century bodies in Europe. The discovery came as a complete surprise to the scientists, who had only expected to find a wealth of information about Winstrup’s life and social conditions in 17th-century Sweden. The imposing coffin in the crypt of the cathedral had been opened several times before, and a black and white photograph taken almost a century ago showed the remarkable condition of the remains, with all his clothes perfectly preserved and his bearded face shrunken but still recognisable from a portrait. The earlier investigations missed the baby, buried in the deep layer of herbs which half filled the coffin. DNA testing is planned for both bishop and baby to see if they are related. However Karsten believes the baby may have been illegitimate and destined for burial in unsanctified ground, and that somebody took advantage of the bishop’s burial to give it a Christian resting place. Winstrup was a scholar, scientist, collector and theologian, and one of the founders of Lund University in 1666, now ranked among the top 100 in the world. He was appointed Bishop of Lund in 1638, holding the title as the diocese and the region transferred from Danish to Swedish control, and died in 1679 – probably, the research has revealed, of pneumonia after several long and painful illnesses including gout, arthritis, gallstones, plaque which would have affected his heart, and possibly tuberculosis. One consequence of his wealth was that he had access to sugar, denied to most people in his day, which cost him the loss of many teeth and decay in several remaining ones. “The gall bladder also has several gallstones, which could indicate a high consumption of fatty food,” Caroline Ahlström Arcini, an osteologist working on the project, said. He had also injured a tendon in his shoulder, which she said meant he would have had difficulty even with simple tasks, such as combing his hair or putting on a shirt. 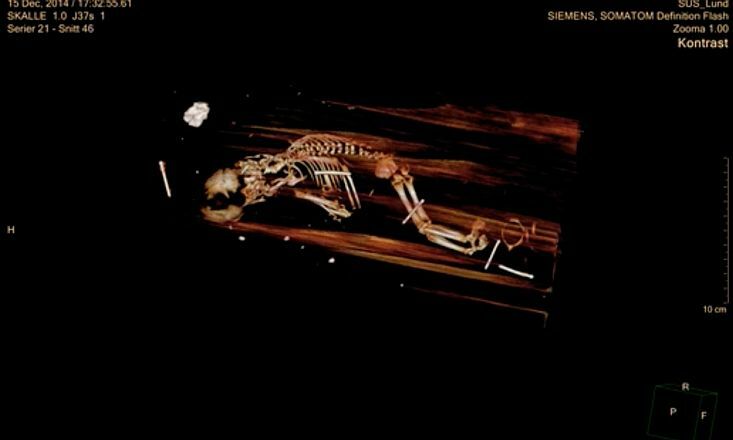 The coffin was opened in order to apply modern scientific techniques to a body known to be in remarkable condition. The other surprise for the scientists was that the body was not embalmed; it was naturally dried out with all its internal organs. The bishop was buried on a mattress stuffed with herbs including juniper and wormwood, and a pillow of hops, which the scientists believe would not just have masked the smell but helped preserve the remains. Although the colours have faded, his clothes were also perfectly preserved, including a velvet cape and leather gloves. More tests are planned, but the two bodies will eventually be reburied – together. 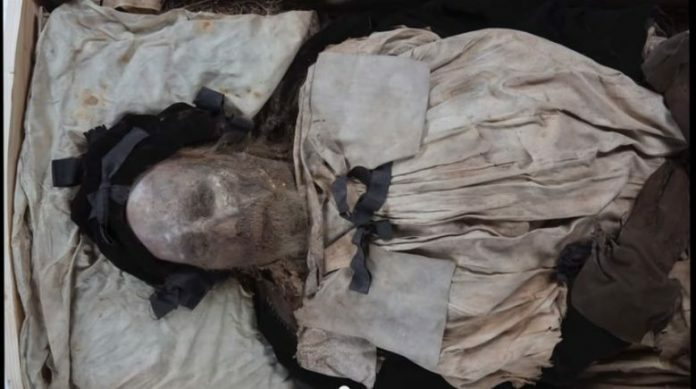 The mummified remains of Peder Winstrup are one of the best-preserved human bodies from the 1600s. Preliminary investigations reveal a sensational find: the internal organs are still in place.